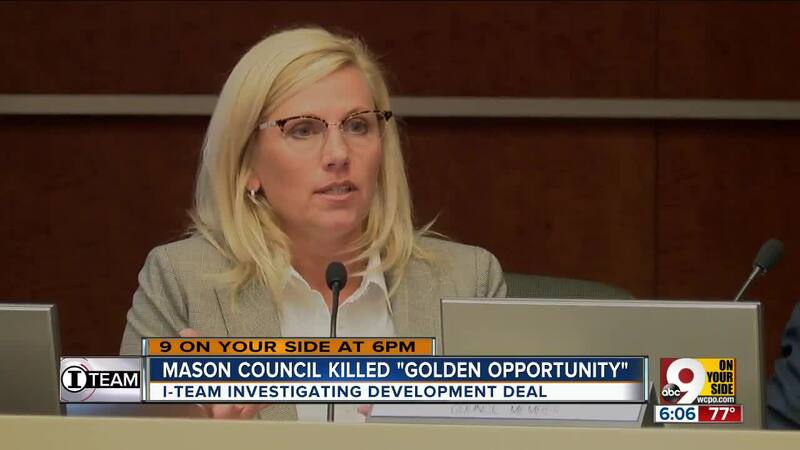 MASON, Ohio -- Did the city of Mason squander a golden opportunity to develop its downtown, or did local officials dodge a boondoggle caused by a conflict of interest? Four months ago, Mason City Council voted 4-2 to buy two downtown properties owned by businessman Ramesh Malhotra, hoping to use them as part of a potential development connected to acres of city-owned land. The council majority agreed to pay $600,000 for the properties worth $546,000, according to the Warren County Auditor. The city also committed to paying an additional $150,000 if it took physical control of the property within the first year. Mayor Victor Kidd had been actively involved in negotiating the deal with Malhotra and discussed his support for the agreement. But, he abstained from voting on it. Council members Kathy Grossman and T.J. Honerlaw voted against the deal, in part because they believed the price was too high. Grossman also said Kidd refused to answer all of her questions about a previous, unrelated contract he signed with Malhotra. "I wasn't born yesterday," Grossman said. "I had a feeling it would not go over well for me to raise red flags about that particular transaction." In December 2015, Malhotra and Kidd signed an $879,000 land installment contract for a 25-acre property near Mason. Malhotra was the buyer, and Kidd signed the contract as the sole representative of the seller, Living Leaf Community Church. Kidd, who was Mason's vice mayor at the time, was the senior pastor of the church. As part of the deal, Malhotra agreed to pay Living Leaf $150,000 within six months, and he assumed the existing $230,000 land contract. He's scheduled to begin making payments on the remainder of the balance -- nearly a half-million dollars -- in January 2020. 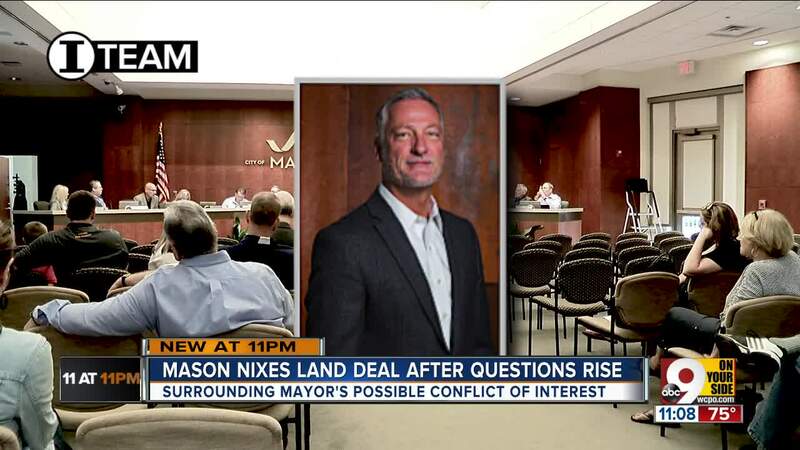 Last year, acting as the Mason mayor, Kidd was involved in negotiating with Malhotra about the downtown land, and in discussions with the council in "executive session," which is closed to the public. "If our seller owes a substantial amount of money to one of the members on council who is negotiating this deal, I believe that's a conflict of interest," Grossman said. Kidd has declined to say if he or his family received any money from the church's land contract with Malhotra. During a special council meeting in May, Kidd insisted he had done nothing improper. "Since there is a persistent effort to cast doubt on my objectivity, I've asked our law director to make a formal ruling on conflict of interest," Kidd said, reading a written statement at the meeting. "Further, I've asked our city manager to seek an outside review from a neighboring law director and to submit a request for the Ohio Ethics Commission to examine the facts and offer an opinion." After making the statement, Kidd recused himself. The city law director said he determined Kidd had not violated ethics laws, but the council still voted 6-0 to not buy the two downtown properties from Malhotra. The recent, unprecedented repeal of a real estate acquisition contract in the City of Mason is a city matter, over which Commissioner Grossmann had no jurisdiction or involvement. As a council member, selected by the electorate, I am responsible for the work I did on behalf of the public. I drove the effort behind the repeal after raising evidentiary-based questions, because those questions, which sought relevant and material information to the transactions at hand, had not been addressed or answered, and still have not. There has been no “punishment” or public attack on Mayor Kidd whatsoever. There has only been an effort to find answers to appropriate, legitimate questions in order to ensure honest services to the public. My actions are driven only by my fiduciary duty to protect the public and public funds. There is no “Kidd –vs- Grossman” issue. To Todd Hudson, the owner of Wildflower Cafe in Mason, it's just another lost opportunity to develop downtown Mason. He said "petty politics" and an attempt to discredit the mayor are to blame. "It becomes about winning, and it becomes about getting re-elected," he said. Tom Grossman: "...that I was trying to hurt the mayor. Not true. You said that I was incompetent. Not true. You said that I damaged and hurt people. Not true." Victor Kidd: "I publicly apologized for saying it in the wrong spirit." Tom Grossman: "Uh huh, but you didn't apologize for making baseless false claims." Victor Kidd: "Because I believe them to be true." Victor Kidd: "But they're not true, Victor." Councilman Rich Cox: "You're a public official. Have broad shoulders. Be broad-shouldered. Don't sit there and whine about somebody being negative about you." The I-Team's review of recent council meetings shows personal conflicts are still aired out during sessions open to the public. "I'm frustrated and I'm angry," Hudson said. "I'm angry that they're dedicating this amount of time to such nonsense." Hudson said that if officials spent less time arguing, the city might have made more progress on downtown development. "It's an inefficient way to run a government, and there's no one in their right mind that would ever run a business like that," he said. Councilwoman Grossman said her focus is only on increasing transparency in the Mason government. She proposed an ordinance requiring additional disclosures by property owners selling to the city. It would have allowed voters to decide if her plan should be part of the city charter. Kidd said it was like killing a gnat with a nuclear bomb. The council rejected it. "When someone has the truth, they just tell the truth," she said. "When someone doesn't have the truth, they pound on the table. Who's pounding on the table? There are people who think you're pounding on the table. I'm just telling the truth."